Located on Vanua Levu, second largest island in the Fiji Islands. Savusavu our picturesque township is only 15 minutes away is well known for its active bubbling hot springs and is also home to hunter pearls, producers of the world reputed black pearl. Savusavu Bay with its natural deep waters is a popular port for international yachts sailing through the south pacific. The world famous Jean-Michel Cousteau Fiji islands resort is adjacent to our lodge. Dining & Entertainment: There are a number of excellent restaurants in town a 15 minute drive away or enjoy fine dining at the Jean-Michel Cousteau Fiji Island Resort, your neighbors, just a few minutes walk down the road. Please note only prior bookings will be accepted. Activities: Beach at your doorstep with great swimming and snorkeling, kayaking, paddle boating. Bush and Rain Forest walking within the property area. Trip to the Pearl farm and factory can be arranged. A nine hole golf course is 30 minutes away at the Koro Sun Resort. If you stay timing is right, watch a family of whales and dolphins swim by the house. I grew up in Suva, the capital of The Fiji Islands, and spent all my adult life schooling and working there. My husband and I with our son, immigrated to Sydney Australia in the late 1980's and returned to Savusavu , Fiji when my husband retired from work. The property was passed down to my husbands family through generations . The first Harman settled on Lesiaceva in 1874. Bathrooms haver ceramic and stone tiles with timber finish. Gas hot water. Excellent restaurants in town, 15 minutes away or Dine at the Jean-Michel Cousteau Fiji Island Resort ( prior bookings only) massage & spa facilities available at the resort. Deep Sea fishing and diving can be arranged through the resort. Nice quiet location, located next to Cousteau resort. Accommodations are good, with air con in the master bedroom. The deck is a good place to relax while looking at the water. Good snorkeling right across the street. Kayaks also available. The housekeeper, Marti, is very nice and helpful. 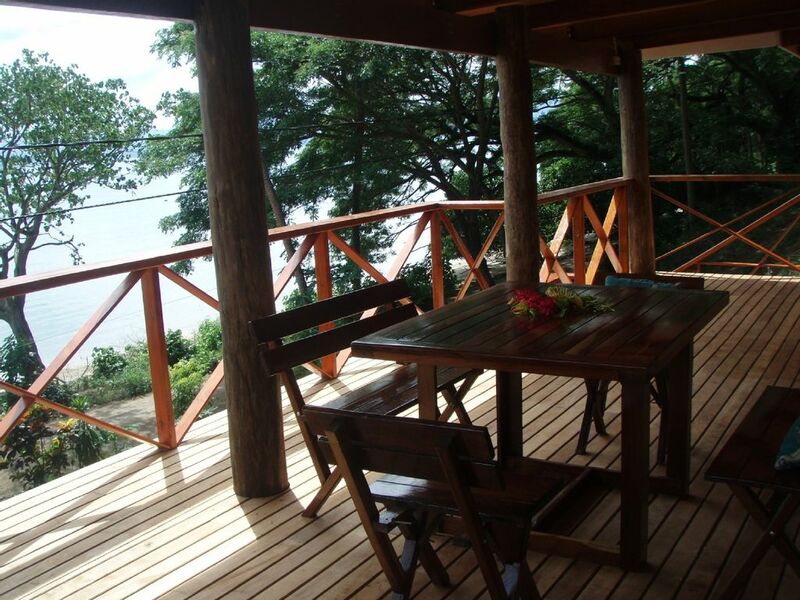 Bay cottage with easy access to kayaking and snorkeling. right across the road from Savusavu bay where we enjoyed snorkeling and kayaking. The view from the large deck is beautiful. The cottage show signs of wear and you must expect insects since it is island living. One note: if you're sweet, bring deet. My husband and I spent two weeks at this wonderful house that is about 5km from the quaint town of Savusavu. It’s easy to take the local bus that stops a few times each day except Sundays and holidays into town to pick up groceries and grab a meal. Purchase a pass for the bus in town as the drivers do not take cash. We would usually hail a cab to go back to the house (about $8 Fijian). Savusavu is right on the bay so quite pretty. The restaurants are low key and good curries are available at reasonable prices.There are a few local stores for purchasing supplies. Most of the shopping is local, but there are a couple nice shops with handmade items. I liked the one behind the market and there are a couple in the marina. The two bedrooms and baths are separate enough to ensure privacy for two couples. Bed was comfy..loved having AC in the bedroom..plenty of hot water for showers. We enjoyed taking the two kayaks out into the bay during high tide. You can see directly into the coral reefs and spot colorful fish. For walking on the beach you need footwear. The house has a good sized covered porch area for enjoying the view and all the activity on the bay. Remember to pack insect repellent. We got good use from the washing machine and clothesline. The inside is roomy with a two burner propane stovetop and microwave for cooking, and plenty of utensils, pots, dishware, etc. There is a nice selection of movies provided also. Highly recommend!! The property provided all the requirements for a comfortable and relaxing holiday. The location was outstanding with fantasic views of the bay, and access to the water just across the road. Malti the housekeeper and her son Raj were gracious and helpful. The Navure Beach Lodge was very nice. Situated right next door to the Jean Michele Cousteau Resort, we were able to use their Dive Shop and their Dive Staff were wonderful to work with. The Lodge had 2 Spacious Bedrooms both with Adjoining Bathrooms with Showers. Plenty of Hot Water and the main Bedroom was equipped with a Air Conditioner that worked very well!! Nice big Deck out in the front where we were able to enjoy the nice Breeze and stay out of the rain. Right across the little street was the Beach, but only accessible when the Tide was down. Snorkeling was right across the street, even though we didn't get to do much due to the weather. Short drive to Savusavu town where we were able to either Eat or get food and supplies from the local stores. Washing Machine at the Lodge enabled us to wash things when necessary and then Hang them to dry on the clothes line that was situated in a Breezeway between the Main House and the Additional Bedroom. The Fijian people were amazingly nice and always had smiles on their faces. The only thing that I can complain about was the slight lack of communication between us and the owners before our arrival, but in their defense, the owners were headed to Australia to see their new Grandchild, so they were easily forgiven. Their Housekeeper showed up a couple of days after we arrived to make sure that things were in order and that any questions that we had were answered. All in All, we had an enjoyable stay and would recommend the Lodge to our Friends wanting to go to Fiji!! Also, if you like Gecko's, you can sit out on the Deck at night and watch them as they feed on the bugs flying around the lights!! Thank you for your positive review. I am so sorry, that my housekeeper was not at the house to meet you, some misunderstanding about your arrival time and unfortunate that our flight out of the country was on the same day. Thank you for booking my cottage. Savusavu Bay has great spots for Diving & Snorkelling, also good fishing in the Bay and outside the reefs.